Professor Kenneth Blum, discoverer of the addiction gene and President & CEO., SynerGene Global, Inc, San Antonio, Texas on the genetics and biochemical causes of addiction. Larry B " Your Sobriety Toolkit"
Duaine M (Dallas, Texas) and Steve A (Austin Texas) - "Texas SOS and SOS in the Texas Department of Criminal Justice"
Celinda Jungheim - Recovery Inc.
Atanonka. F Portals Dual Diagnosis Residence, LA. Veronica Redd, actress and SOS International Advisory Board member. Gary Grossman & Michele Von Euer "Improv for Awareness for Non-Actors"
On August 11,12,13, 2000, more than 80 people crowded into the SOS International Clearing House in Los Angeles, California, for the most successful and best attended SOS event ever held ! SOS is clearly alive and well, and kicking and growing as witnessed by the enthusiastic contributions from SOS members from all over the US and internationally. 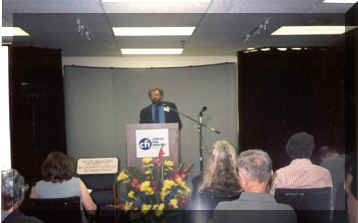 The speeches and wide attendance by respected figures in the professional recovery movement also attested to the fact that the SOS approach and organization is an historical fact, with deep roots and a huge reputation. 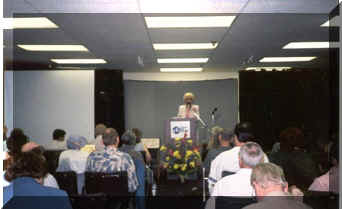 The Conference focused entirely on sobriety methods for recovering people. 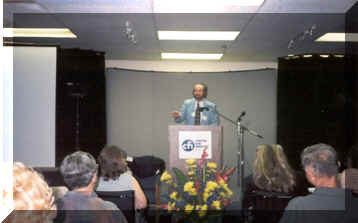 Attendees were treated to a tapestry of approaches and techniques for understanding addiction and strengthening sobriety based upon the ideas of total abstinence from all mind-altering drugs developed by Jim Christopher. SOS members from as far a field as New York, Texas, Colorado, Boston, London UK, Belgium, etc spoke of the nitty gritty key issues of staying sober and building local SOS groups. SOS members Duaine M (Dallas, Texas) and Steve A (Austin Texas) gave an inspiring report on how they were working in the Texas prisons where SOS is officially welcomed by the authorities as the only alternative to AA for helping prisoners get sober and help avoid returning to goal. Steve himself was attending by permission of his parole officer and explained how he met SOS in prison and successfully used its approach to stay clean and to stay free! There are now more than 100 SOS meetings in Texas prisons!!!! Malcolm Rees from London explained how focusing back on the basics of the Sobriety Priority had helped expand the London SOS and gave attendees a folder of tips to take home to their local meetings. Especially well-received was Larry B's talk on his Sobriety Toolkit, Atanonka.F's ideas on an Independence Week of action on recovery and the personal reflections of early SOS members, one of whom had just come back to say thanks after 15 years of sobriety without attending SOS groups! George N highlighted eloquently the importance of SOS as a safe and comfortable environment for gay people to recover and the actor Kenneth Campbell gave a stirring speech on the secularized Gorki method which he uses in his SOS group. A lot of interest was also shown in using Emotional Intelligence as a tool for helping recovery, when Steve Morgan explained his EQR or Emotional Recovery Approach for Sobriety. To add to this more imaginative methods for strengthening sobriety came from a simulated performance by 4 members of Recovery Inc, who showed how they used cognitive methods to deal with disturbing everyday incidents and behavioral problems. "Improv for Awareness for Non-Actors" gave a display of how to use dialogue and improvisation to touch personal questions and issues. On a more solemn, but warm note Cookie S from San Diego gave a speech in honor of Jean Kirkpatrick, the founder of "Women for Sobriety", who died in June and to whom the Conference was dedicated. Cookie went on to say that she agreed entirely with what she had heard at the SOS Conference and it was proposed that our two organizations should work more closely together in the future. Emphasizing the strong links and respect for SOS in the professional recovery sector, enthusiastic speeches about the work of SOS were made by visitors from social services, National Social Workers of the US, mental health professionals. The authority of SOS nationally and internationally was underpinned by the speech of Dr Randolph Atkins from the University of Virginia, who has chosen SOS to be the study group for comparison with AA in the role of spirituality and secularity in recovery. SOS has agreed to participate in this study which can have wide ramifications for the traditional view of effective treatment methods. But the man who brought the house down was undoubtedly Dr Kenneth Blum, the discoverer of the addiction gene, who explained extremely complex but vital issues concerning the causes and treatment of addiction, in the most informative and entertaining way the audience had ever seen.